One of the most wondrous products of nature is the creation of a natural pearl by a mollusc. This fortuitous event occurs so rarely in nature that virtually all of the true pearls sold for jewelry are cultured pearls, which are created when the pearl formation process is instigated by man, by the insertion of a pearl nucleus into the mollusc. Though all completely natural pearls are rare, there are some especially rare varieties which are treasured by collectors. They include the Conch pearl (from the Lobatus gigas species) and the Melo pearl (from the Melo volute). Melo pearls do not come from an oyster or clam, but are formed in the shell of a very large sea snail belonging to the gastropod mollusc species known as Volutidae. 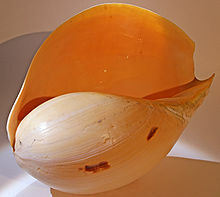 The genus Melo is also commonly known as the Indian volute or "bailer shell", since the very large shells were used to bail water from canoes. The Melo species is found only in southeast Asia, from Burma to Thailand, Malaysia and Vietnam to the South China Sea and the Philippines. Unlike common pearls, Melo pearls are not formed from layers of nacre. 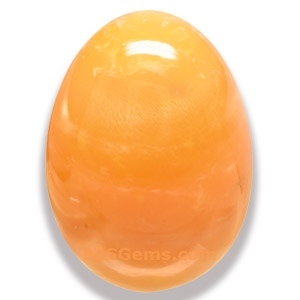 The chemical composition of the Melo pearl is calcite and aragonite. But while Melo pearls are non-nacreous, they are formed in the same way as more common pearls. It may take as long as several decades to grow a Melo pearl of significant size. Melo pearls can be quite large and occur in a variety of shapes. The color of the pearls range from tan to dark brown, with orange being the most desirable color. They have a hardness of about 5 on the Mohs scale. These pearls exhibit a porcelain-like luster that make them very attractive. The surface may also display a silky flame-like structure that makes a Melo pearl especially valuable. We have recently acquired 3 rare Melo Pearls, with the largest (pictured above) at 22.11 carats. You can view our collection on our Pearl Page. This month we feature new acquisitions to our collection, from Africa, North America, Europe and Asia. A big bright tourmaline in a gorgeous padparadscha color. Beautifully fashioned in an elegant heart, this unusual gem will make an important pendant. Guaranteed natural and untreated. A brilliant and bright Iolite over 10 carats! This large Iolite has been custom cut and polished to perfection to bring out the best of this fine material. This lovely gem is ideal for an impressive ring or pendant. Guaranteed natural and untreated. Cobaltocalcite is a rare variety of calcite colored by traces of cobalt. This gem is notable for its highly saturated color and superb translucency and has an amazing glow when backlit. Gem-quality cobaltocalcites over 10 carats are very rare, especially in this vivid color. This fine specimen will delight the most discerning collector. Certified by GIA as natural and untreated, including a Notable Letter which states that "The large size, highly saturated reddish purple color and high degree of transparency makes this a notable cobaltocalcite." A gorgeous large zircon in a deep slightly greenish blue. This is beautiful material, very clean, with superb fire. Well cut with excellent luster, this fine gem will dazzle in your jewelry design. Guaranteed natural by AJS Gems, Bangkok. A very rare natural Melo pearl in a large size! This beautiful pearl has a creamy orange color with a porcelain luster and it displays the silky flame structure characteristic of the finest Melo pearls. A fine piece for the rare pearl collector. Guaranteed natural and untreated. According to data for published by the Kimberely Process Certification Scheme, total world diamond production for 2014 was 124.778 million carats, a decline of 4% from the previous year. Russia became the top diamond producer in the world, with 38.303 million carats, followed by Botswana at 23.187 million carats, Canada at 12.011 million carats and Angola at 7.430 million carats. Here is something you might not have considered when choosing a precious metal for your rings. The Emergency Medical Journal in the UK reports that titanium wedding rings are causing problems in hospital emergency rooms because the metal is too tough. Titanium has become popular because of its strength and durability; it is also hypoallergenic and light. However, doctors are complaining that the metal is actually too strong, noting that industrial equipment has been needed to remove titanium rings from swollen fingers. While other metals such as gold and silver are easy to cut, doctors from the U.K.’s Sheffield Teaching Hospital say titanium requires specialist equipment such as dental saws, drills and diamond-tipped saws. This is an issue that bench jewelers know well, since the metal is notoriously difficult to work and titanium rings cannot be soldered or resized. We have just cut several more cobaltocalcites, including some smaller stones in the 1 to 5 carat size. Many of these display the same saturated color as our larger specimens and provide a good option for collectors looking to add a very rare gem to their collection. See all our Cobaltocalcites. The difference in the cost of cabochons versus faceted gems is in the quality of the material, not the cutting cost. Generally only transparent gem material is faceted, while lower grade material (translucent or opaque) is fashioned as cabochons. Nonetheless, there are some rare cabochons which are quite valuable, such as especially fine Star Ruby or Star Sapphire with excellent translucency.